This collection of essays is a unique celebration of women’s stories and spirituality through the ages. 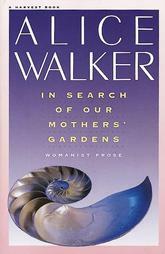 Alice Walker traces the umbilical thread linking women writers through history – from her discovery of Zora Neale Hurston and her collections of black folklore, to the work of Jean Toomer, Buchi Emecheta and Flannery O’Connor. She also looks back at the highs and lows of the civil rights movement, her early political development, and the place of women’s traditions in art. Coining the expression “womanist prose,” these are essays that value women’s culture and strength, the handing on of the creative spark from one generation to another.